India has always been an incredibly rich region, both in EUROPA UNIVERSALIS IV and in the real world. After all, a sea route to India was what precipitated the Age of Discovery. And in DHARMA, the riches of the east are yours for the taking. Will you play as an Indian nation and build up a mighty Indian empire, whose wealth and power are the envy of the world? Or will you play as a European colonizer, and try to claim India’s riches for yourself via either diplomacy or conquest? The choice is yours! Not only is India very rich in terms of wealth, but also in terms of history. The Indian subcontinent has an incredible history that stretches back thousands of years. And in the period covered by EUROPA UNIVERSALIS IV, from the Age of Discovery to the early 19th century, India went through much tumult and changes, as in the rest of the world. In this rework of the subcontinent in DHARMA, Paradox makes an effort to do the region justice in this regard, and it shows. Paradox clearly did their homework! 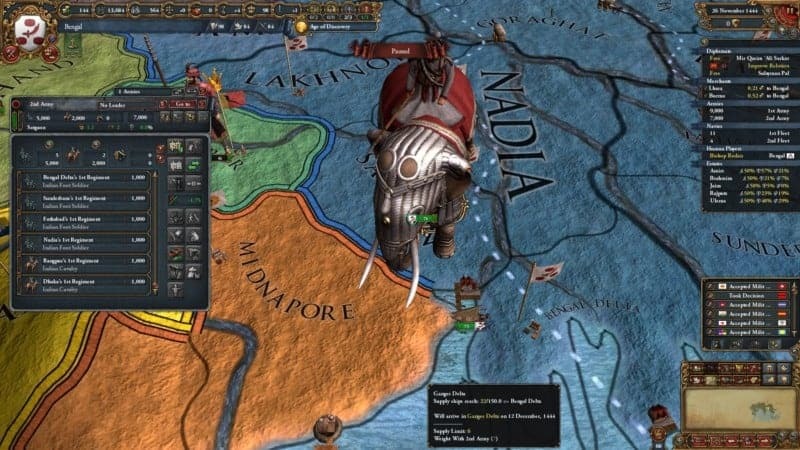 A feature of the new DLC: Elephants! Courtesy of Paradox. 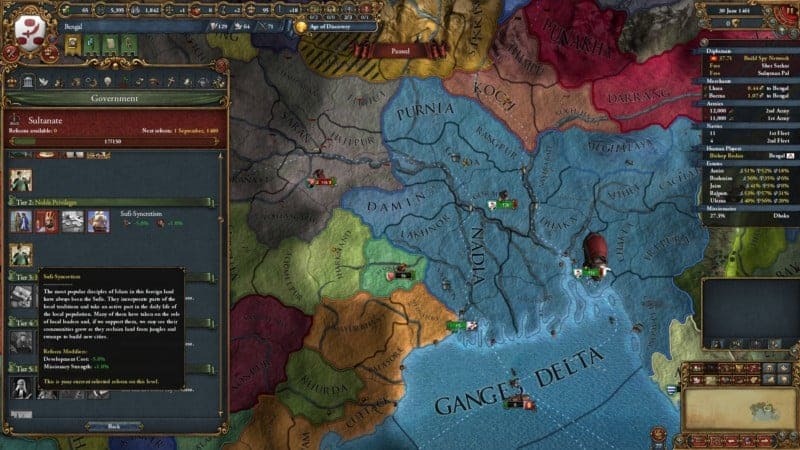 Since the initial release of EUROPA UNIVERSALIS IV in August of 2013, Paradox Development Studio has not been content to simply leave the game as is and rest on their laurels. No, ever since the initial release, Paradox has continued to improve and update the game with new expansions and patches. 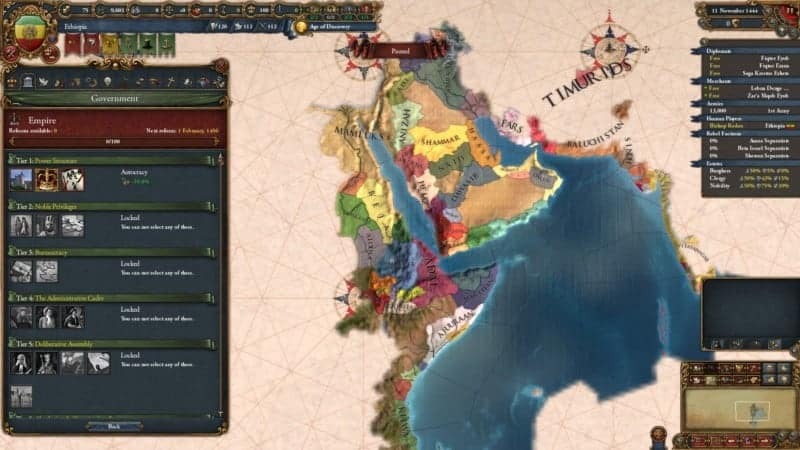 DHARMA is the 12th major expansion for EUROPA UNIVERSALIS IV, and, as one can guess by the name, it focuses heavily on the Indian Subcontinent. I could not help but be thrilled by the announcement, as India has long been one of my favorite regions to play in. 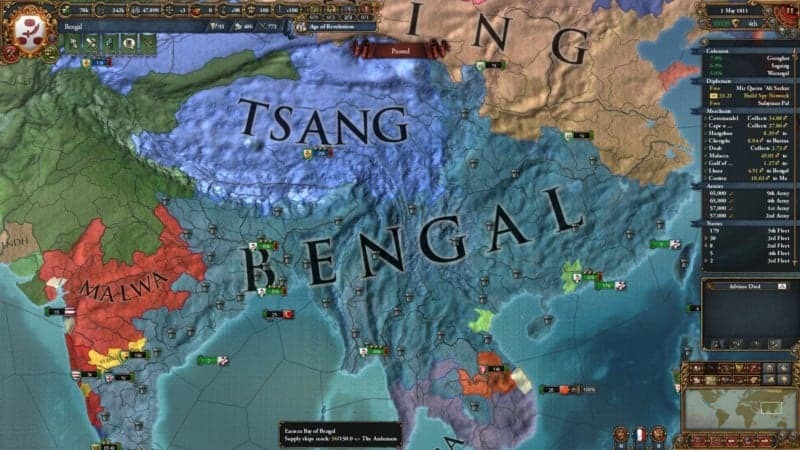 The Indian region, while greatly improved from how it was in the initial release of the game, has been largely unchanged since the release of the ART OF WAR expansion, which was nearly four years ago. Thus, while other regions of the world (such as Mesoamerica, the British Isles, China, Japan, and the Middle East) have all been expanded upon, India has remained largely static, and honestly has really needed an overhaul for years. Well, with the release of DHARMA, that day is upon us. 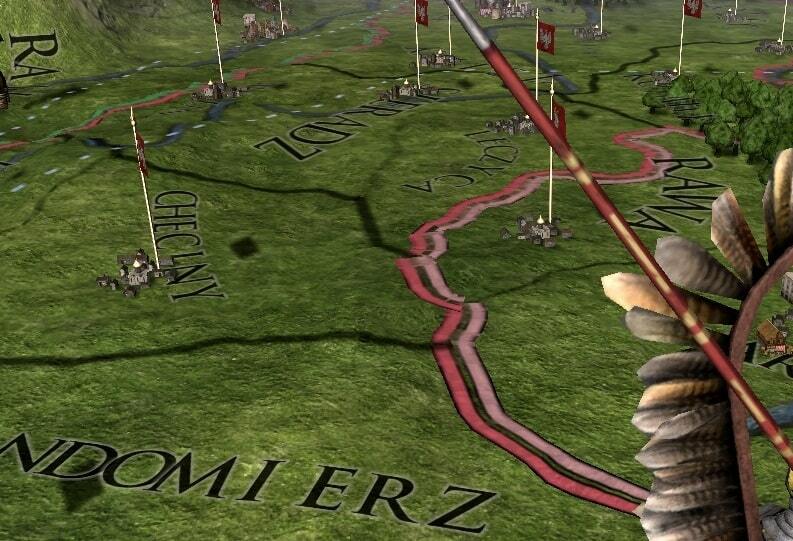 Many will be familiar with Paradox’s DLC strategy, especially if you have read my previous Paradox article. Every major DLC released by Paradox for EUROPA UNIVERSALIS IV (and all their other games) also includes a free patch that adds content to the game even if you do not buy the DLC. DHARMA is no exception. 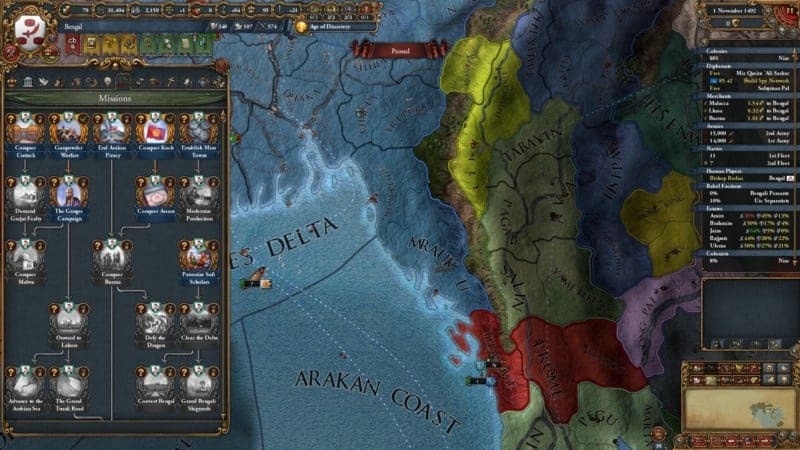 The video above, a pre-release video by EUROPA UNIVERSALIS IV game director Jake “DDRJake” Leiper-Ritchie, scratches the surface of what is included in the DHARMA update. But this begs the question: if I am going to spend twenty dollars on this DLC, what am I going to get out of it? Is it worth dropping that much money on the DLC immediately? 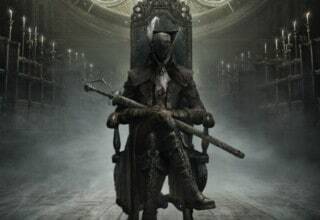 Or can I just make do with the free additions until the DLC inevitably goes on sale eventually? 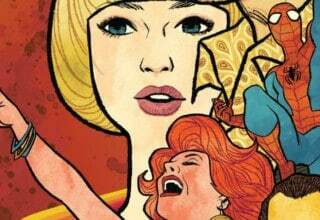 Well, this review will attempt to answer these questions and help you decide whether or not to take the plunge now. To start with, we shall examine what is actually part of the paid expansion, and what is part of the free patch. First, let us look at the paid features of the DLC. A screenshot of the Bengal mission tree, part of the DHARMA expansion. Courtesy of Paradox. Firstly, the expansion includes new mission trees for a multitude of nations, mostly in India. Mission trees, originally introduced in the RULE BRITANNIA DLC as part of an overhaul of the outdated Mission system, have always been a neat idea in concept. However, their implementation for most countries has left a lot to be desired. While some countries, such as England, France, and the Ottomans, have unique, engaging, and fleshed out mission trees, most countries have pretty bare-bones ones. Most are lucky to get even a few unique missions, while much of the world only gets the generic missions with nothing unique at all. Well, with DHARMA, this changes. Now, a multitude of notable countries get their very own unique mission trees. And they are fully-fleshed out mission trees, to boot. As you can see in the screenshot of Bengal’s missions above, they are unique, flavorful, and comparable in scale to those of top-tier nations like the Ottoman Empire. They certainly made my inaugural DHARMA game as Bengal a more engaging experience! Indians aren’t the only ones to get some love, however. Owners of the THIRD ROME DLC will find new mission trees for Muscovy, Novgorod, Russia, and the various minor Russian principalities. In addition, generic regional missions for North and South Indians, as well as Tibetans, are included in the free patch. A Government of, by, and for… me! A screenshot of the Government Reforms screen. Courtesy of Paradox. One of the flagship features of the DHARMA expansion is a massive overhaul of how governments work. 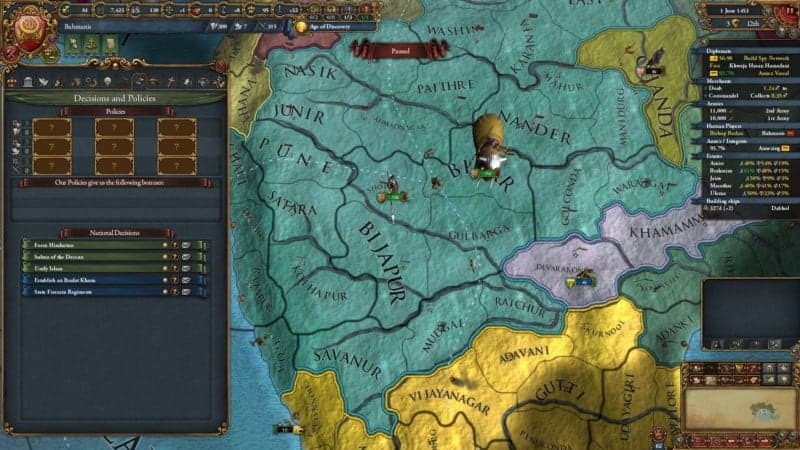 Prior to DHARMA, the way governments worked in EUROPA UNIVERSALIS IV was, by and large, identical to how they worked back in EUROPA UNIVERSALIS III. You unlocked new governments through technology, with each giving different bonuses, and you swapped them with a button. 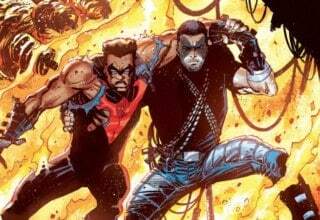 The most interesting thing about them was the various government types, many of which were introduced later. For example, that of the Ottomans. However, the system has always felt rigid and bland, a linear progression without much variation. In DHARMA, all the previously existing government types, such as Feudal Monarchy, Despotic Monarchy, and so on, have been merged into one singular monarchy government type. Ditto for Republics, Theocracies, Tribals, and so on. Instead of a linear progression of government types, you now get government reforms. You can see the Government Reforms screen in the screenshot above. How does this system work? Well, you gain progress towards government reforms over time. The progress is sped up by lower autonomy in your provinces. When you have earned enough progress, you can choose a reform that will give your government different bonuses, and possibly unlock new mechanics. You can unlock one reform per tier, and you can also swap reforms out, though doing so is quite costly. Mechanics which were previously unlocked via unique government types, such as the Ottoman Sultanate and the Japanese Shogunate and Daimyo, are now gained from reforms instead. Personally, I find this system to be far more interesting and engaging than the previous system (which remains for those who do not purchase DHARMA). 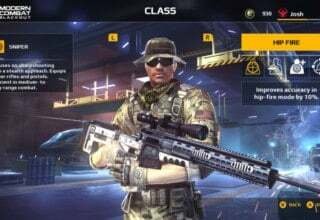 It allows you to customize your government to work with your playstyle and to choose what bonuses work best for your nation. Whether you are a min-maxer or more RP-focused with your playstyle, you can make your government your own. While the reforms available could use a bit more variation, I have hope that Paradox will continue to expand and improve upon this system in the future. A screenshot of the Trade Company Investments screen. Courtesy of Paradox. Another flagship feature of the DHARMA expansion is a rework of the Trade Company mechanic, as well as provincial Centers of Trade. Introduced in the WEALTH OF NATIONS expansion way back in 2014, trade companies have long been a bit bare-bones and lacking. DHARMA gives them a rework that makes them both more useful and flavorful. This is in addition to the more minor feature of making provincial centers of trade more dynamic than just a simple static modifier. For trade companies, you can now be more proactive and subtle in how you acquire them. While conquest and colonization are still options, you can now also charter provinces for your trade companies. 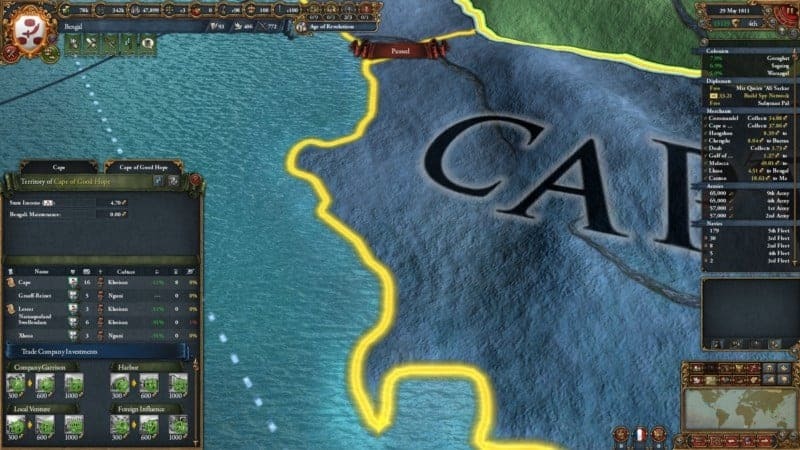 That is, assuming you can find a native ruler who likes you enough, colonizers can purchase a province from native rulers, allowing them to get a toehold in the region through coin rather than cannon. As happened historically! The feature allows for more versatility and historical accuracy when it comes to acquiring the riches of Asia and Africa for yourself. Not only that, but you can upgrade your trade companies with investments. These are special buildings that you can construct in your trade company provinces that provide benefits to both you and nearby native rulers. This gives incentives for native rulers to charter provinces beyond mere coin. You can see examples in the screenshot above. Finally, centers of trade. They now have three levels, each granting higher bonuses. You can upgrade them for a hefty sum, allowing for greater dynamism in which provinces become richer and more prosperous. If you do not own DHARMA, they remain static, largely the same as before. Overall, these are nice little features that make the world both more historical and dynamic. The Indian Estates, exclusive to DHARMA. Courtesy of Paradox. This review is getting pretty long. So, I will sum up the remainder of the paid DHARMA features in this section. Indian countries get unique estates with DHARMA, representing the various castes that make up Indian society, pictured above. Without DHARMA, Indians get the generic estates. The Mughal Empire, historically a major player in India until being destroyed by the British in the 19th century, also gets unique bonuses that allow it to assimilate newly-annexed cultures with ease. Colonists now have a use other than colonizing. Your Exploration ideas will no longer be useless after all the “empty” provinces have been colonized. No, with DHARMA, you can now send your unused colonists to develop your provinces. When you do, there is a small chance they will boost that province’s development. It’s small, but at least your colonists won’t be sitting on their hands anymore! DHARMA also adds monsoon season to the game. They function similarly to winters mechanically, except there are also special events for them. It’s not a very big feature, but it’s a neat little addition. Having your troops auto-suppress rebels is easier with DHARMA. You can set different armies to focus on quashing rebellions in specific areas. No longer will your troops march across Eurasia and back! Finally, DHARMA also lets you have teams for multiplayer. It’s a welcome addition even if I don’t do multiplayer often. The new policy screen, part of the free update. Courtesy of Paradox. OK, so that’s a lot of paid features. But what about if I can’t or don’t want to purchase DHARMA immediately? What does this update do for me? Worry not. Even those who do not purchase DHARMA will find goodies galore in this update. For example, the expanded map and new ideas for India (and to a lesser extent Tibet and Southeast Asia) will be available to all who download the update. Not only that, but the policy system has been given a rework, as seen in the screenshot above. You can now have up to three policies of each category. In addition, policies have been buffed significantly overall. This means that pretty much all policies are viable choices, and you won’t stick to the same old policies every game. This is available regardless of whether or not you purchase DHARMA. Finally, estates. Estates were previously a paid feature of THE COSSACKS expansion. But no longer! Estates are now integrated into the base game, available to those who do not own any DLC at all. Owners of THE COSSACKS now instead get unique estates and governments/government reforms to compensate for the loss of this previously paid feature. However, these are only the generic estates. Unique estates, like those of DHARMA and THE COSSACKS, still require the appropriate DLC. From the latest EU4 developer diary by DDRJake. Poland is next to get a rework! Courtesy of Paradox. 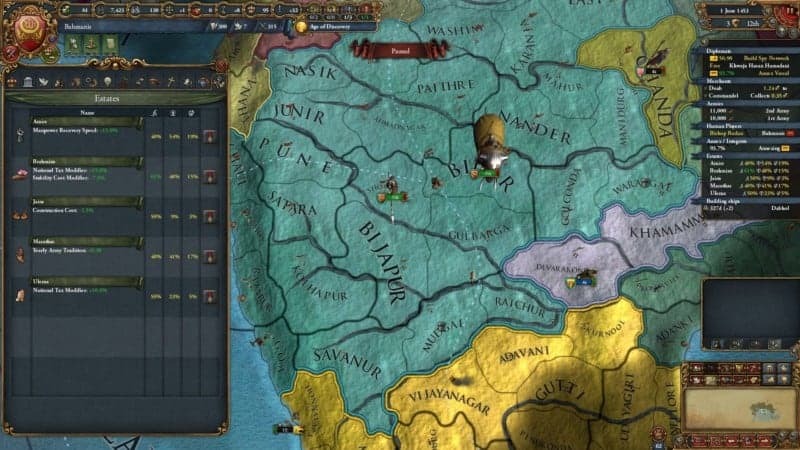 Paradox has never been content to rest on their laurels, as mentioned at the start of this article. Moreover, Paradox has always been one to listen to their community. This is important to mention because a couple of the balance changes in the latest update (namely involving religion and corruption), have been… ill-received. In the latest developer diary by game director DDRJake, Paradox made it clear that they are listening to the feedback about these changes. 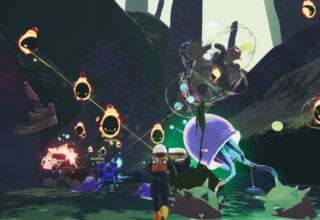 The next proper update, version 1.27, will use the feedback they’ve gotten to modify these changes in such a way that is more palatable to all involved. In addition, it will also add new content. For example, the land of many of my ancestors, Poland, shall get some much-needed attention! The Verdict: Should I Buy DHARMA or Not? The mighty Bengal Tiger! Courtesy of Paradox. 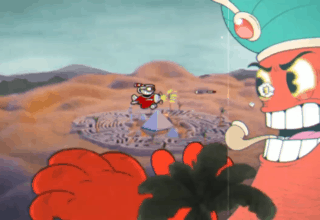 So you’ve listened to me yammer on about the DLC for god knows how long. Or you just skipped to the end to hear the verdict. Regardless, now comes the moment you’ve all been waiting for: should you buy it? Should you hold off for now until it goes on sale? Or just give it a pass entirely? To that, I say: it depends. If, like me, you enjoy playing in India and want to see the region as fun as it can possibly be, then yes. This is worth buying. This is definitely a must-have for anyone who has an interest in playing an Indian nation. If, however, you have no interest in playing an Indian country, my advice would be to wait until it inevitably goes on sale in several months. 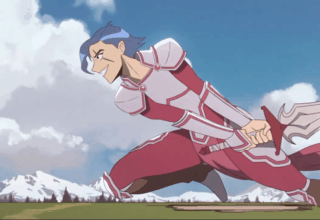 It is true that DHARMA adds something to the game regardless of whom you play as. But I will be completely bluntly honest: I’m not sure what it adds for non-Indians is worth twenty dollars. When it eventually goes on sale (Paradox games always do at some point), then you should definitely pick this up. But now, unless you love playing in India as I do, it’s probably best to hold off a bit. A screenshot of the government reform screen as my go-to Indian country, Bengal. Courtesy of Paradox. Previous article Seven Seas Entertainment Licenses 3 New Manga!